What do you get when a money-driven corporate conglomerate is opposed by a small band of Christians united in their supernatural call and conviction to fully obey the prompting of God? This modern-day David and Goliath story is Davis Bunn’s newest thought-provoking novel. A young ambitious advertising executive seizes his chance to play in the big leagues and impress his media mogul bosses with a stunningly comprehensive strategy to shape societal trends by exploiting hopelessness. But God is at work. Five individuals in different parts of the country hear God’s call to specific action. Their obedience to the first step leads them to an unexpected divine appointment where the five “accidentally” meet one another. As the newest media barrage is made public these five lives merge and take a turn to stand against manufactured hopelessness with the message of true hope. The story builds slowly and becomes riveting as the conflict between good and evil escalates. I found the ending to be somewhat anticlimactic, but that too is more like real life. The story has elements that are very relevant to society today and would make for wonderful family or book club discussion. For example, two questions that came to mind 1) With all of the outcry against “corporate greed” why are we unconcerned about entertainment corporations? It is a terrible thing when retirement funds are mismanaged and stolen, but do we care when the virtues and values of a generation are systematically stolen and replaced reaping terrible consequences in society? 2) How can I impact those around me by conscientious obedience to the promptings of the Holy Spirit and the clear message of Scripture? The Turning by Davis Bunn is a compelling story and a worthwhile read. I received a complimentary copy of The Turning from River North Fiction in return for my honest review. Dreams. They have been a fascination throughout the history of mankind. They are common place and yet mysterious. We wonder at their origin and their purpose. Biblical accounts tell us of divine warnings to mitigate future disaster. Disney tells us, “a dream is a wish your heart makes.” Dickens tells us dreams are the result of a bit of moldy bread or an underdone turnip. In “Hidden in Dreams” by Davis Bunn a brand new possibility is presented. Book 2 of the Elena Burroughs series, Hidden in Dreams stands alone and is a quick-paced story of intrigue and impending world-wide financial collapse forewarned by a series of dreams. Are these dreams a divine warning or is something more sinister afoot? Dr. Burroughs and some unlikely allies unexpectedly find themselves in the position to unravel the mystery. Hidden in Dreams is a good read. It brings together engaging characters, a believable plot set amidst contemporary themes and a refreshing perspective. It made for lighter reading than other titles of similar genre (mystery/psychological fiction). I give this title a 4-star rating. If you like relaxing before bedtime with a good book, you can shed the cares of the day and drift back into the 1850’s American south aboard The River Rose. Take part in my book giveaway and you’ll be paddle-wheeling down the Arkansas River in no time! You’ll need your glass of warm milk to fall asleep though because this story of love and adventure is one you won’t want to put down. This second book in the author’s Water Wheel series was surprisingly different from other book series in that it is a completely new story instead of a continuation of the first book, The River Queen. In The River Rose we meet new characters on a different steamboat working a stretch of the Arkansas and Mississippi Rivers. This approach gave me a fresh perspective on the era when riverboats were a major source of transportation and livelihood. Two strangers are brought together when they inherit the Helena Rose from an unknown distant relative. Jeanne Bettencourt and Clint Hardin at first glance seem as different from each other as night and day but they both bring past experiences, skills and connections that make the operation of a riverboat possible and even profitable. With their rag-tag but loyal and hardworking crew they overcome challenges to make their partnership a success. When crisis comes putting her family and her future in jeopardy, Jeanne’s faith and friendships help her navigate the turbulence ahead. The distinctive personalities of the characters aboard the Helena Rose are delightful. Their humorous banter made me chuckle and I felt almost a part of a wonderful eclectic family. The River Rose is a very enjoyable read with a great balance of drama and humor. Would you like to win your own book? It’s easy! Just leave me a comment letting me know what river (or other body of water) you would like to travel and why? For a second entry, follow Gilbert Morris’ blog, and let me know in a separate comment. I will leave the giveaway open for one week, on June 27 I’ll draw the winner! You can read the first chapter of The River Rose for yourself by copying this link! Would you like to escape the manic pace and technology overload but don’t have the wherewithal to retreat to your own private island? Drift back in time with “The River Queen” as Gilbert Morris takes you to the romance of the pre-Civil War south. With opening scenes and characters reminiscent of Gone with the Wind get a glimpse of grand plantations populated by dapper young men and bustling southern belles in the busy commercial center of Natchez, Mississippi. When unforeseen events precipitate a change of fortune, the beautiful Julienne Ashby and her family are taken from the pampered plantation life to the nitty gritty hard work of survival and facing forces that threaten to corrupt virtue if it is based only in tradition and good manners. At times unwillingly introduced to new ways of looking at herself and the others around her, she begins to understand and appreciate the witness of an undervalued friend. Working side by side with and depending upon people she considered beneath her station, ingrained prejudices slowly begin to soften as she learns that worth, integrity, and even love are not measured by social status, but by the character residing within an individual. I enjoyed being transported to another era and learning historical tidbits and details of life in a bygone era in the southern United States. It was a simpler time, but the challenges of life especially in the face of tragedy and change are common to man regardless of time in history. Seeing how the various characters in the story were stronger and became better than they knew they could be when faced with daunting challenges was realistic and encouraging. I do a lot of research type reading so it was relaxing to read, as B&H Publishing says, for pure enjoyment. 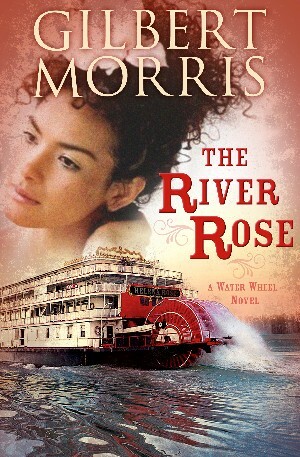 I am currently reading the latest, just released book in Gilbert Morris’ Water Wheel series entitled “The River Rose.” Look for my review in mid-June. Read “The River Queen” and revisit a time when the river was the lifeline of the nation. Relish this story of life, toil and triumph on the mighty Mississippi.